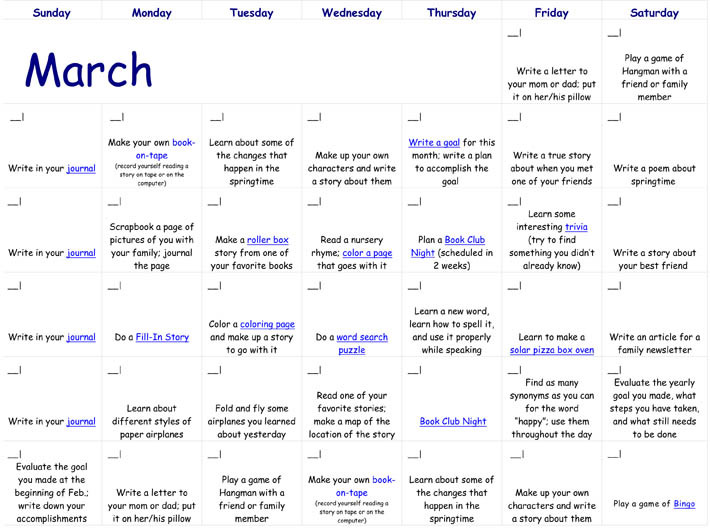 A reading calendar, or reading club, can be a fun way to help children feel more excited about reading. 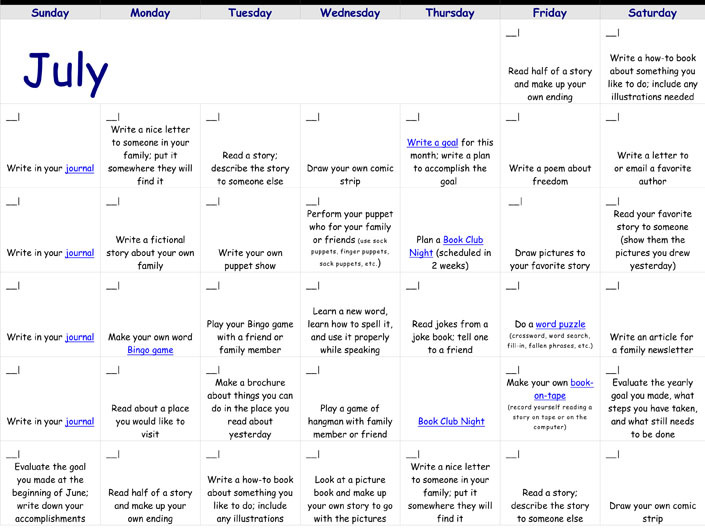 We have our own Reading Club calendar here on our site. 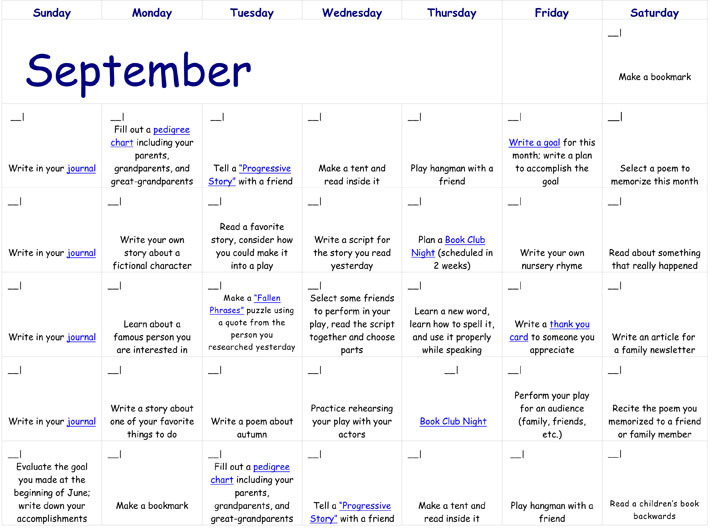 Simply choose the upcoming month and print out the calendar! 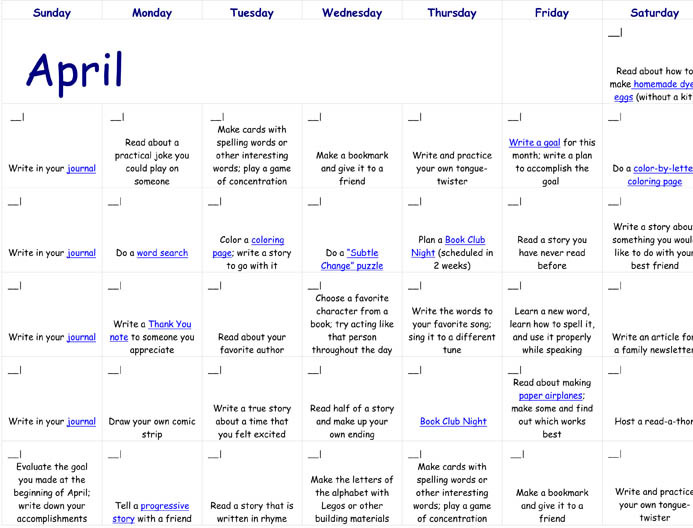 There are several different activities on the reading calendar. Most of these activities are intended for children who can read themselves. 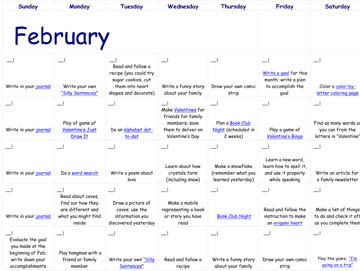 If you have pre-readers, however, you can still use the calendar, but you will need to change some activities to meet the needs of your children. For example, on a day with the instructions, "Write a letter to someone who lives far away," your child could draw a picture for someone, sign their name, and help you address and stamp the envelope. Kids love these reading clubs. They find it exciting and interesting to participate in the different activities. Also, it is an eye-opener to them to recognize how much we really need to know how to read. So many activities in everyday life require reading, and this helps them to understand just how important reading is. We also realize that some of these activities may not work for everyone. If this is your case, change the activity to fit your own situation. 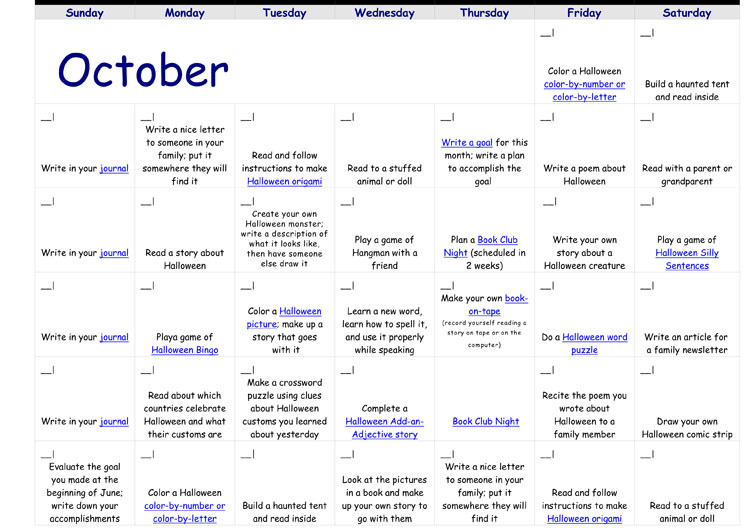 Also, if there are some activities that fall on an inconvenient day, feel free to switch dates. If you have questions about what some of the activities are, you can find the information here on our site. 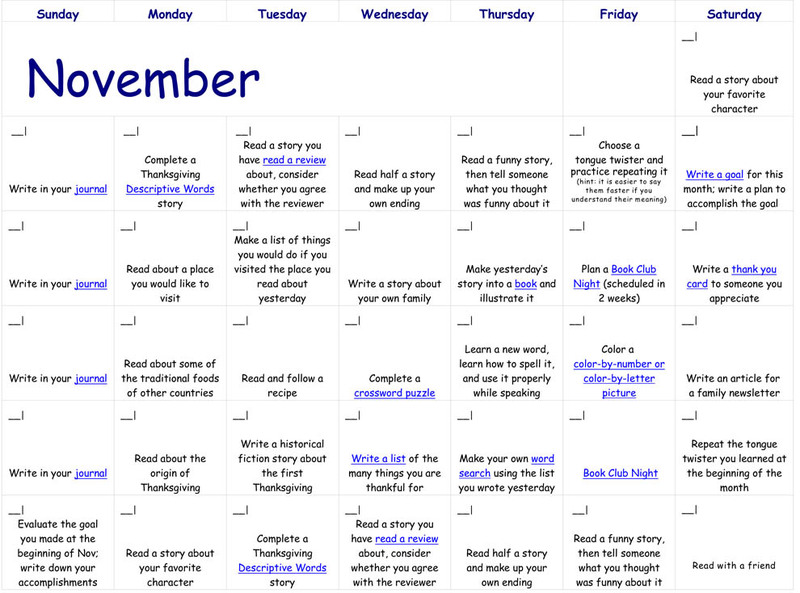 We have provided hyperlinks from the reading calendar itself. 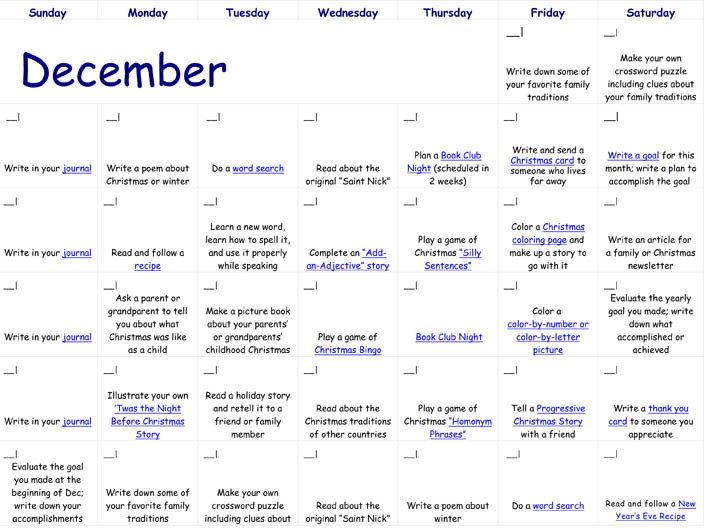 After opening the calendar, an Acrobat Reader window will open, and you will be able to click on the links. We have also provided a list to the pages you may need at the bottom of this page. We encourage you to take your children to the library often. Many families have a great assortment of books for children to choose from at home, and that is great for your kids! But some of the activities may require reading beyond what your kids may find in their personal libraries. If you are unable to make it to a public library, try looking on the internet for the information you need. These calendars have been formatted so you can use them any year. 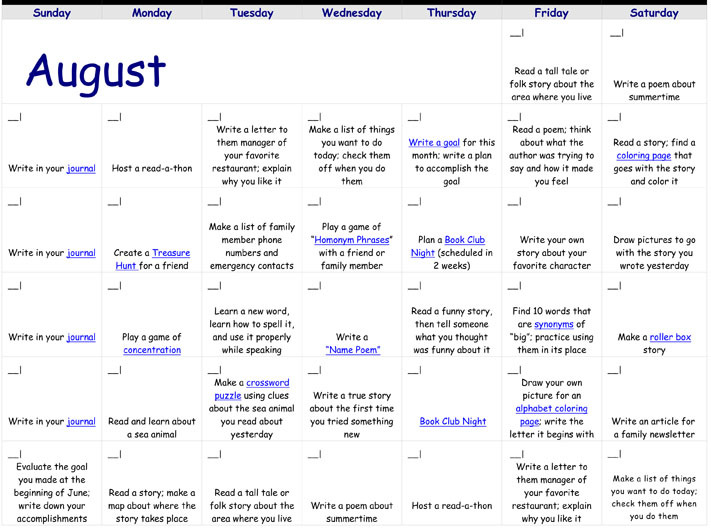 Simply print out the calendar, then fill in the dates in the upper left corner for each day. So, if this month begins on a Wednesday, start with a number 1 in the first Wednesday of the month and continue numbering from there. If the month begins on a Friday or Saturday, be sure to check the very top of the calendar to see if you need to start on the top row.